Who is driving this thing, anyway? I was on a server I could use free, but didn't have that much disk space. (Okay, so I ran the machine and could have increased my quota. But I think that would have been a little... slimey.) In the end, it really just turned out to be my prototype/developement site, anyway. After about a year, I was ready to move on. But I still had no web storage. There were 1020 usable images after editing, but didn't have the space to put them online. So the Trip Report I wrote was an abbreviated one. Instead of a thousand pictures, 129 made it on the site. I did some more research into html, css, java, yadda, yadda, yadda and rewrote the site, and in April 2008, got a real domain name and *this* site was born. But in 2012 (a mere 4 years later) I was redesigning the site for the third time, and was reimaging every picture from scratch to make the entire site more consistant. So when I was doing the pictures from 2007, it was only logical to complete the project that had been on the back burner for years. And here we are. Except it didn't turn out to be just the addition of some pictures. The text is all original and unchanged from the original report, just in a different order. Any new comments from 2012 have been put in brackets, [like this]. Keane's 2007 Fall Vacation, or Is it time for my mid-life crisis yet? This is an abbreviated trip report. Just the highlights. And the lowlights. You can google me and find another one of my trip reports from 2002. I have an odd sense of humor that you'll have to deal with, since I know many things don't survive into the written word. Enough administravia, on with the show. So the plan was to wait until Disney announced their fall annual pass rates, make reservations, and then go to wherever the tress were turning colors. So I have five nights at Saratoga, arrival 10/21, depart 10/26. Check Universal's web site. No annual pass rate rooms for 10/19 to 10/20. August 22, 2007. Check MNSSHP availability. 10/23 is a passholder night. $10 off per ticket. Okay, I'll bite. Purchase 2 will-call tickets. Still no annual pass rooms at Universal. Check 10/26-10/27, *after* my trip to Disney. There's a room available at the Portofino. I've never been there (I've been at the Royal Pacific three times, and Hard Rock twice, but never the Portofino) so I book two nights. So there are two hard dates I have to plan for in Disneyworld, Day 7 for the Halloween Party, and Day 8 for the nighttime Extra Magic Hours in Animal Kingdom, otherwise all the dates are flexible. Planning done. Now I just count the days. No real reports of trees turning color. Between the hot weather this year and the drought in the Southwest, there's some slim pickin's. We need to make a decision on where to go. We decide to go to Great Smoky Mountain National Park and take part of the Blue Ridge Parkway in North Carolina. Even if there's no color, it'll be a nice drive (wrong) and it's on the way to Florida. It's a 10 hour power drive to Gatlinburg, Tennessee. There's some color the trees as we go Southeast, maybe we'll get lucky. Finally get to Pigeon Forge about 5:30PM Eastern time. I was last through this area in 2000. Wow. Pigeon Forge and Gatlinburg might as well be one city now. 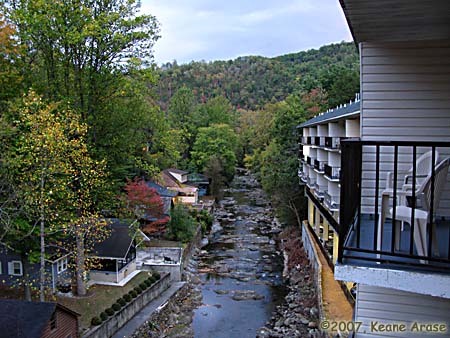 Pigeon Forge and Gatlinburg has become a combination of Wisconsin Dells, Branson, International Drive and the less shady parts of the French Quarter all rolled into one. I hate places like this. Hundreds of tourists in hundreds of cars, gawking at everything and pretending they remember how to drive a car. The Comfort Inn is on the river, and has some nice views out the balcony. We drive into Gatlinburg, and find a promising restaurant. It turns out to be another random, nameless, completely forgettable place. We visit a couple of the candy stores and shops along the main drag, and call it a night. We might have a long day tomorrow. I'm sure I'm not giving Gatlinburg/Pigeon Forge it's due, but I'm not there to visit Gatlinburg, *or* Pigeon Forge. Gatlinburg is the gateway to the Great Smoky Mountains National Park. I made the reservation for the room using frequent stay reward points, so not only was the room free, but you don't have to pay those stupid 'entertainment' taxes. We stop at one of those local pancake houses for breakfast. Why can't I get good eggs outside of the Midwest? At least they filled up my travel mug with coffee, so they get a thumbs up from me. Get into the Park, stop at the Visitors Center. It's sunny with fluffy white clouds. Might be a nice day after all. (Wrong.) 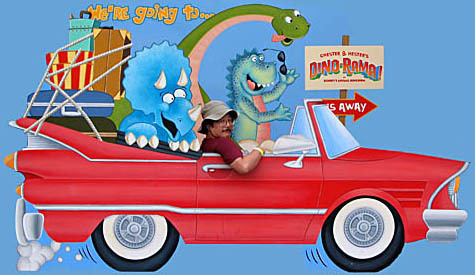 Mr. Ranger tells me that due to the warm weather, there's really no color change in the Park. Bummer. Bypass plans to go further into the park, and just take the main route directly to the Blue Ridge Parkway. The last time I was through here it was early March, so there weren't any leaves on the trees. Now there's nothing but leaves. And they're mostly green. Some rain, some fog, but it's not that bad. PiC decides we should go up to Clingmans Dome, the highest point in the park, which is supposed to have some great panoramics. Instead, we get a portent of things to come. As soon as we get above about 3000 feet, the low clouds we've been seeing becomes fog. We get to the parking lot, and walk the first 500 yards or so, and find that my 600ft above sea level body is objecting to the 6000ft above sea level air. There isn't any. Or at least there isn't as much. Further, it's cold, damp, and you can only see 30-50 feet. Our first excursion ends with a whimper. Stopped in at Mingus Mill, a working mill built in 1886, and the Mountain Farm Museum, where the roosters only crow when my camcorder is off. We soon find ourselves on the Blue Ridge Parkway. 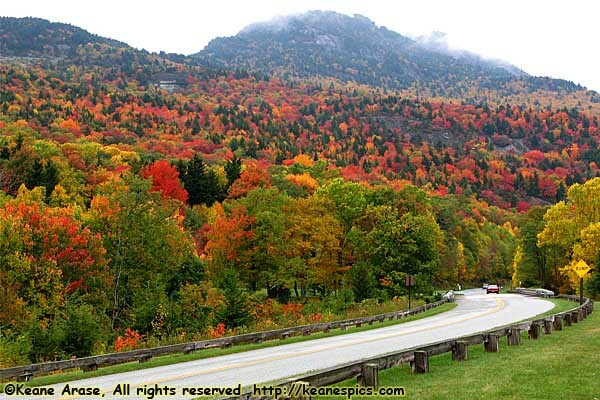 The Blue Ridge Parkway follows the crest of the Blue Ridge Mountain chain. We sometimes get *some* color, but we never see the sun. Worse, as we climb in elevation, visibility sometimes gets so bad you can barely see the other side of the road. We're forced to crawl at 10 to 15 miles per hour. We end the day in Asheville, North Carolina, 100 miles short of my intended stopping point. I try to find a Comfort Inn that's supposed to be at the exit from the parkway, but can only find a Ramada Inn. I call the Comfort Inn, only to find it's now a Ramada Inn. Well, another mystery solved. At least there's a decent BBQ (real smoked, don't need no stinkin' sauce BBQ) joint close by. The next day is just about as bad, but I'm determined to get at least as far as Grandfather Mountain and the Lynn Cove viaduct. I do. After vacating the Parkway, we get away from the mountains, and the fog goes away. We're on a speed run South down US-321 toward Charlotte, when I see a Quonset hut. Painted pink. The sign says "The BBQ Man". I announce lunch. Or maybe it's called supper down here. Any arguments about having BBQ last night is squelched, and I make a U-Turn. The pork gets 5 stars. Wallowing back out to the car, we get south of Charlotte and call it a night. Speed run down I-77 to I-26, first time I'll be on either of these interstates. Then onto I-95 to Central Florida. Not much to see, farmland and forest and swamp. Somewhere in Georgia, we decide to stay on the East coast of Florida, and then go to Kennedy Space Center (KSC) the next day. There's a shuttle launch in 3 days, after all. Room isn't bad, it even has a stove and a fridge. Ron Jon's is a block away, and it becomes a destination for later. I refrain from looking up Nelson, Healy or Bellows in the phone book. We look at available options for dinner. There's a Sonny's Real BBQ Pit. PiC doesn't even try to argue. We're a block from the beach, and go there first. You can see a Disney cruise ship leaving port. I'm sure there are reasons people like to cruise, it's just not my thing. We start walking towards Sonnys, and can't figure out how far away it is, so we fetch the car. It's a good couple of miles. While good, it's a distant third compared to the two previous days. After we get back, we walk right through the new hotel next door to Ron Jons. I've seen the billboards for this place for years. Two stories of stuff for the beach. And there you are. Next day I'm pleased to find that the signs to KSC don't route me all the way back to I-95. It starts to rain like it did the last time I was here. It eventually stops and becomes a pretty nice day. But that was later. The tour itself is pretty cool. When we get to the closest point we're allowed from Pads 30a&b, the Tour Guy explains that even though we're a mile away from the launch pad, the sound blast from a shuttle launch would kill you. What an interesting fact... You eventually end up in the Apollo / Saturn V Center, where they have one of the last three Saturn V's. The sucker's huge. We were hungry by that time, and had one of the nameless theme park burgers in the cafeteria they had there. After the tour, we went through the two story gift shop, and I didn't buy anything. Even I was amazed. We left KSC intentionally early to get to Saratoga Springs during the day, so we could get a feel for the place without the hindrance of dark. Saratoga Springs Resort (SSR) is the 6th Disney Resort I've stayed at, and felt (at least to me) like a larger, more opulent Caribbean Beach Resort. Since we weren't there as Vacation Club members, we got maid service every day. There was concern there for a couple of minutes as we read the rules. No comments on the Turf Club (the resort's table service restaurant,) PiC didn't like anything on the menu. The first panoramic suffers from not having enough information on the bridge at the 180 degree mark. 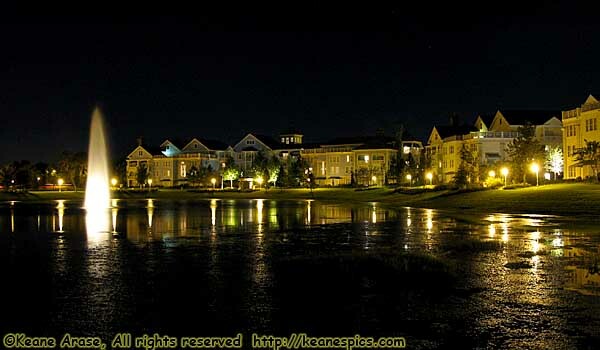 :-) Other images are from walks around the resort, and the last three are panoramics from West Side in Downtown Disney. End End Keane and PiC's October 2007 Florida Trip - Part 1 of 6.